Many people like playing dice game, and if they want to make sure they can win the game, they will figure out some ways, dice cheating device, such as using the magnet casino magic cheating dice with remote control or non magnetic remote control dice. And except for using in the dice games, remote control dice is also used in poker game. For example, you can use the remote control dice to decide who the first hand is in Texas Holdem and Omaha game. 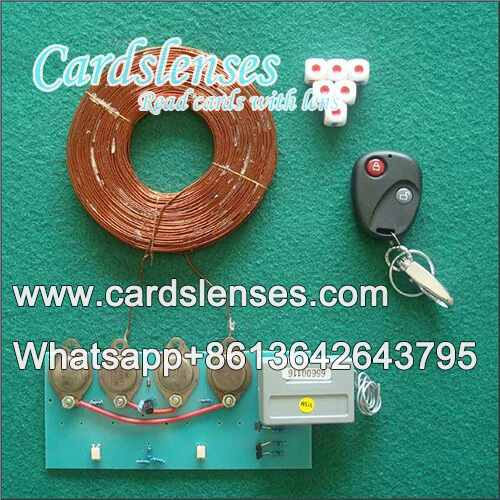 Remote control dice is a set of casino dice cheating device, including one magnet dice, one remote control board and one remote control. We use the milky color dice to make remote control dice. We do not use the transparent dice because we need to install a tiny magnet and using the positive and negative poles to control the dice pips you need. That means one dice is just having two sides you can control. For example, if you need 6 pips, then, another number is 1.